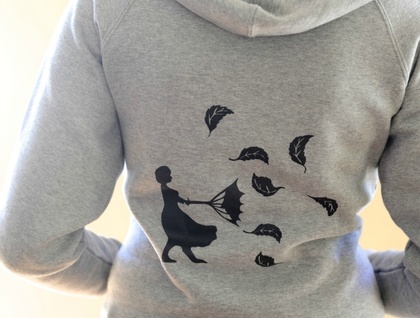 A heavy weight hoodie (made by AS colour) with a silhouette design of a girl holding an umbrella that has turned inside out and a scattering of leaves flying about. This design was inspired by the Wellington wind! The hoodie is slim fitted and long in the body. Contact tuitwotoned to enquire about payment or shipping options.